Recently Cervelat: Die Schweizer Nationalwurst, a cookbook devoted to the people's sausage was published. Cervelat cordon bleu? Cervelat curry? Cervelat in your fondue? It's all in there. It's a gorgeous book, with history and with recipes by Beat Caduff and text by Peter Krebs. Here's a version of one of the recipes from the book, perfect for an Apéro, as an appetizer, or as a light dinner with salad. Fry the onions and garlic in the oil until translucent. Add rosemary, salt and pepper. 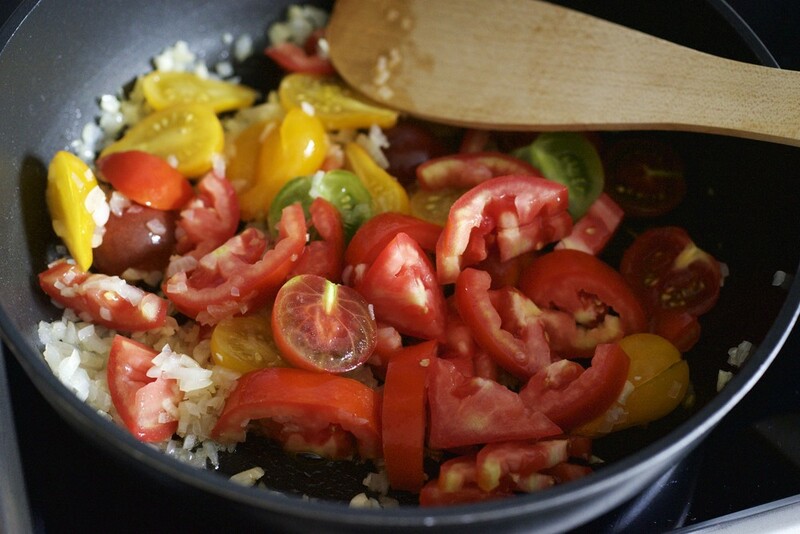 Add chopped tomatoes to the pan and cook for a few minutes. Then add the cognac. Put the chopped cervelat in a medium bowl. Pour the warm tomato mixture over top and stir together. While the mixture is still warm, either use an immersion blender, or add the mixture to a food processor and blend until you get a uniform mixture. Spread this on crackers or toasted baguette and decorate with basil leaves. You could use any similar processed sausage for this dish. If you have a powerful food processor handy, you would probably get a much smoother result. The immersion blender left it a bit chunky (as you can see below). To toast the baguette, arrange pieces on a baking tray, brush with olive oil, sprinkle with garlic powder, and bake at 200C / 400F / gas mark 6 until golden.